Mischling ("mixed-blood" in German, plural: Mischlinge) was the German legal term used in Nazi Germany to denote persons deemed to have both Aryan and Jewish ancestry. A superbly crafted original story that takes a dark moment in history and makes it vividly shocking. Mischling by Affinity Konar, is a tale of two sisters, twins, who are placed in a camp where other twins have also been assembled. Nicknamed "Mengele's zoo" this place was unusual, and the twins (or their parents that left them there) knew what would await their future. They are told that they are the chosen ones, and led to believe they will have a better future both for themselves and their families if they stay at the "zoo". Auschwitz had been built to imprison Jews. Birkenau had been built to kill them with greater efficiency. What this place was, wasn't entirely clear. But they are told that they are important...some more than others based on the colour of their hair or kind or eyes. Yet, as circumstances prevail, their importance is deemed more of an illusion. Subjected to a slew of experiments, the sisters find themselves first believing all the lies told to them, and then slowly coming to terms with the reality that they are being exploited. Uncle (as the twins refer to him) is the doctor in charge of the camp and while pretending to be compassionate and kind, he is slowly subjecting them to controversial treatments to document their reactions. Stasha describes him as a person who's "posture resembles one would found himself at a family reunion after years of estrangement, eager to learn about the lives of others but preoccupied with hiding his own identity." "He smiled his laboratory smile, but i could tell already, he was tiring of my jokes. So I made my face intellectual and severe, and peered at the needle with interest, as if i were in the front row of a schoolroom with a teacher I very much wanted to impress." Uncle manipulates to get his way. He tells Stasha that these treatments will make her immortal and she will be able to help her sister. She believes him at first, until little by little, her enthusiasm fades. These unethical and highly controversial scientific experiments were conducted on the innocent victims who were unable to fight back. And in this case, the target was young children, who were also identical twins. Affinity Konar has created a very believable narrative, one which makes us gasp. Making us think: were they really doing experiments on identical twins? Some treatments were shocking. Chemicals poured into the children's eyes to get rid of the brown in them. Sometimes the experiments went as far as to separate one twin from the other. 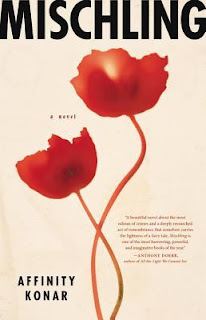 The cruelty in the book is heart wrenching but author Affinity Konar keeps the focus on the twins, making Mischling a journey we eagerly want to go on. And like most epic adventures, this one is rift with sadness, shock, and above all the human ability to keep on living. Stasha and Pearl must rely on one another, but their strong bond also wants to protect the other, which sometimes justifies the lies they may tell each other. They make a pact. Pearl would have the past and the present. But she doesn't want the future. So, that's how the role of keeper of time and memory went to Stasha. "I wanted to argue that playing games would help her feel like a real girl again, but even I wasn't sure of this fact. The numbers the Nazis had given us had made life unrecognizable, and in the dark, the numbers were all I could see, and what was worse was that there was no way to pretend them into anything less enduring or severe or blue." While the twins parents are made to believe that they have left their children for a better life, this is not the case. The health deteriorates from the various experiments and the lack of proper food. The bread is full of bromide, and it makes the children forget things. "All it took was a day's worth of crust lining your stomach to make your mind mist over. Since I was in the half in charge of time and memory, I alway gave the bulk of my portion to Stasha." The bond of the sisters has been beautifully captured. Their inherent love for each other makes them fiercely protective. I've read a few books lately about this wonderful bond in other books such as Bone and Bread by Saleema Nawaz. I have a sister as well and i could relate to the love and rivalry, which I spoke about at a recent Canada Reads event. Pearl and Stasha are smart and spirited, and they learn to adapt and coordinate their hearts for protection's sake. The structure of Mischling also makes for the enjoyment of the novel. Told in alternating perspectives, each chapter switching from one twin to another, makes the story even more endearing. With voices that are convincingly unique and a storyline that is both powerful and original, Mischling is one of my recommended reads for 2016. Mischling is published by Penguin Random House Canada.